And on top of the evidence we’ve already provided—essentially that parking minimums, surface lots, and large structures hinder housing development, drive the affordability gap to even further distances, and increase pollution—it seems that the nonprofit Council of Infill Builders and their research team have arrived at the same conclusion. In a scathing report entitled Wasted Spaces: Options to Reform Parking Policy in Los Angeles County, the report conducted by a group of group of builders, public officials, nonprofit advocates, and land use experts noted exactly this: excessive parking requirements and poor parking management can undermine a community’s economy and environment by wasting space and increasing pollution. 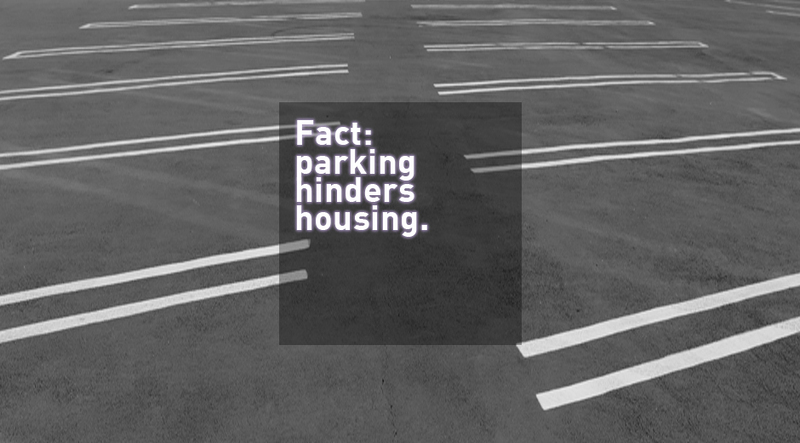 “There is a general public perception that there is not enough parking—and that isn’t true,” said Ashley Atkinson of American Planning Association (LA). The benefits of implementing the policies put forth by the report are astounding: reduced traffic, lower costs and prices for housing and businesses, improved social equity for low-income and next-generation residents, revitalized downtowns with more safe, convenient, and walkable neighborhoods. Disturbingly, nearly a fifth of incorporated land—some 200 square miles, nearly 40% more than the square miles dedicated to actual roadways—throughout the County is dedicated to parking, making land available for housing to become extremely low. Add onto this parking requirements for housing developments that unfairly pass along much of those costs onto renters and lower income families, and the County is set for failing on keeping its most marginalized populations housed. The benefits of implementing these policies are astounding: reduced traffic, lower costs and prices for housing and businesses, improved social equity for low-income and next-generation residents, revitalized downtowns with more safe, convenient, and walkable neighborhoods… Even improved fiscal revenues for funding community investment priorities and improved overall transportation networks and mobility are possible outcomes of implementing the nonprofit’s suggestion.